The replicas of the Bus Rapid Transit system’s proposed new stops sat on the side of the room as Miller, an employee of Pittsburgh’s Department of City Planning, explained that the focus of the evening’s meeting was to discuss changes to bus stop locations in Oakland. The event, which took place at the Oakland Career Center on Semple Street, was one in a series of meetings taking place both in Oakland and in other communities around Pittsburgh. 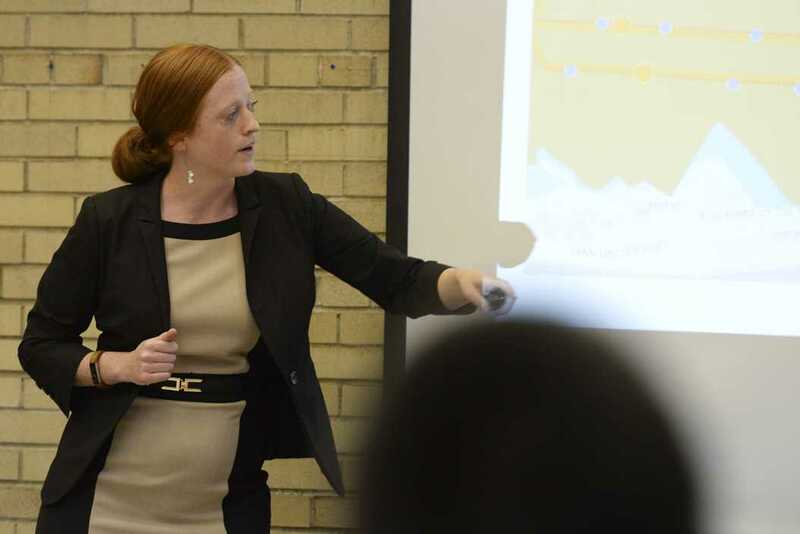 Billed as a “community input meeting,” the presentation was designed to take into account local concerns related to the implementation of a BRT system in the next several years. The BRT system, which would run three lines all from Downtown to Oakland before diverging toward different neighborhoods farther to the east, would supersede most bus lines and bus stops currently along Forbes and Fifth Avenues. Under the current plan, there would only be four stops in Oakland on Fifth — Chesterfield Street, Atwood Avenue, Tennyson Avenue and Craig Street — and four more on Forbes — Halket Street, Sennott Square, Schenley Plaza and Craig Street. The stops for the BRT system would vary in size from small, or “neighborhood size,” to large “transit centers.” The smallest proposed stops would be about the same size as existing covered bus stops in Oakland, while the largest could be up to seven times larger. The new stations would be physically larger than those currently in place, according to Miller. Amenities include kiosks present at most of the large stations displaying the real-time arrival estimates for BRT buses. Despite the skepticism many residents present at the meeting expressed, Amy Silbermann, one of the presenters from Port Authority, claimed that data for arrival times would be helpful. “We have found the predictions to be quite accurate,” she said of the arrival times for public transport vehicles fed to transit apps, like Google Maps, from the city. While a large part of the meeting’s purpose was to determine locals’ opinions about where larger stations might be appropriate in Oakland, several attendees came to the meeting to discuss other concerns they had with the proposed transit project. One woman who said she lives on Frazier Street in South Oakland complained that her section of the neighborhood was virtually inaccessible by public transportation and suggested that the city had misplaced priorities by focusing specifically on transportation along Forbes and Fifth Avenues. Another resident objected to the planned shortening of the BRT’s central route. Where current Port Authority buses travel as far out from Downtown as Swissvale, the proposed BRT terminus would be located in Wilkinsburg, with riders traveling further out needing to transfer. “I think it’s bunk,” the resident exclaimed. Other attendees brought up the potential impact of the changes to public transportation on residents with disabilities. One concern was that the larger bus stops that would be added to Oakland sidewalks might make it difficult or impossible for those with disabilities to maneuver them. “All of this would be [Americans with Disabilities Act] accessible,” Silbermann said in response. But some community members were left unsatisfied, both on that issue and on others. Another woman in a wheelchair in attendance complained that the winnowing down of the number of bus stops contradicted what the community — particularly the disability community — had worked for. “We fought long and hard, got politicians involved. We fought for a long time to get that stop,” she said.